Gutenberg is not just a new face for WordPress. Beyond the eye-candy - and at times, its shortcomings - Gutenberg’s modularity allows for limitless possibilities. Thanks to Advanced Gutenberg, you do not have to think about adding functionality, but you can instead focus all your energy on your creative creations. Our new WordPress plugin piles features on your Gutenberg editor, expanding your repertoire to make your blog posts stand out. Picking up rapid pace, Advanced Gutenberg has received two new updates in quick succession, and today we are taking a look at what you can do with your new toolbox. A structured article leads readers through articles without having them think about it. The first introductions to Advanced Gutenberg 1.3 and 1.4 help you organize blog posts and pages. Sectioning content is one good starting point, and one of the new blocks focuses especially on this aspect. The new separator block for Gutenberg lets you introduce sectioning without the need of adding headers. The stylish block informs your readers of a change in tone or subject without taking much space. You cannot think of organization without mentioning tables. In Advanced Gutenberg 1.4, tables have received a significant push thanks to the new advanced table block. This block does not only help you organize information, but it comes with all the essential tools to customize presentation to suit your data’s needs. Tables can be modified in various ways. These include basic options, like modifying the text and background color and alignment. Furthermore, cells can be modified individually by changing borders and padding. Beyond the basics, JoomUnited’s tables now also support images and HTML content within cells. WordPress does not have to be all about text, text and more text. In an age where numbers are taking over text, and data science is thriving, Advanced Gutenberg has added a new count block to display statistics alongside your content. In similar fashion, a new testimonials block lets you embed client satisfaction in your pages with relative ease. Both blocks allow you to separate statistics and testimonials respectively using columns. Furthermore, they provide functionality unique to each type, like avatars for testimonials. Speaking of column layouts, depending on your WordPress blog’s font and overall style, you may want to give your content some breathing space. To this end, the text columns block has been boosted with new customization options in the form of custom margins and paddings. Advanced Gutenberg 1.4 also has something in store for content creators, or bloggers who want to enrich and diversify their content through multimedia. 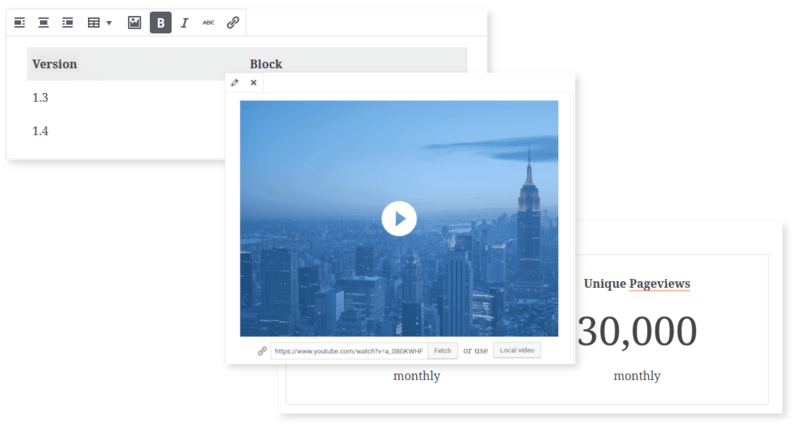 Two new blocks from JoomUnited allow you to embed videos and images right alongside text. 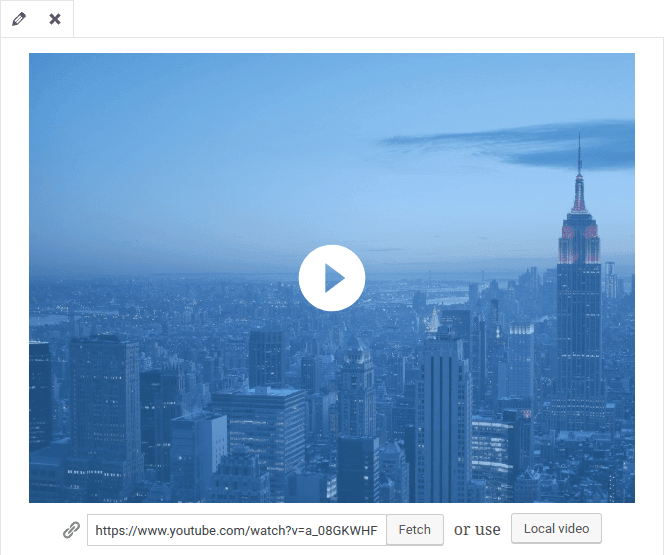 The advanced video block supports Vimeo and YouTube videos, or locally-hosted files. The player itself can be customized as well. For example, the play button icon can be changed using a preset selection, alongside its size and colors. The video thumbnail can also be changed at will. The player’s behavior and style is not set in stone either. Although by default videos occupy the full width, the dimensions can be fine-tuned manually. Moreover, videos can pop up in lightboxes or viewed inline. Complementing the advanced video block is the advanced image module. This module can be used to showcase products, share pictures of your travels or any other creations you can think of. Borrowing from the flexibility of the video block, as a content creator you can customize its look and feel in a number of ways, including by overlaying text. The final major introduction to Advanced Gutenberg is a mini-map. 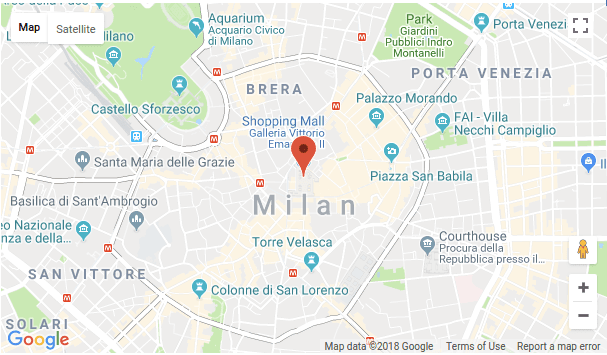 Powered by Google Maps, the new map can be used to pinpoint the exact location you are talking about or guide potential customers to your business’ physical location. As in our other new blocks, the map can be fully customized; Google’s iconic marker can be replaced with a custom one, and a concise description can be inserted alongside the map. Like patchwork, Gutenberg’s repository of tools keeps expanding thanks to Advanced Gutenberg. With new tools to play around with, the latest versions of Advanced Gutenberg for WordPress allow you to experiment, bringing new content to new audiences.